One of the parties developing the massive Gaylord Rockies Resort and Convention Center in Aurora is selling its stake as the property prepares to open, in a deal that values it at nearly $900 million. Ares Management said Friday that it is selling its stake to Ryman Hospitality Properties Inc. and RIDA Development Corp., the two other parties in the development’s joint venture. Ares said the two parties will pay approximately $270 million in a deal expected to close by year-end. In its own Friday announcement, Ryman Hospitality Properties said its portion of the deal involves paying $242 million in cash for approximately 27.3 percent interest in the joint venture entity. That equates to a property valuation of $886.4 million. The deal will increase Ryman’s ownership stake from 35 to 62.3 percent. Gaylord Rockies Resort and Convention Center is a 1,500-room hotel and convention center being built just southwest of Denver International Airport. Construction began in early 2016, and the property is expected to begin operations by year-end. 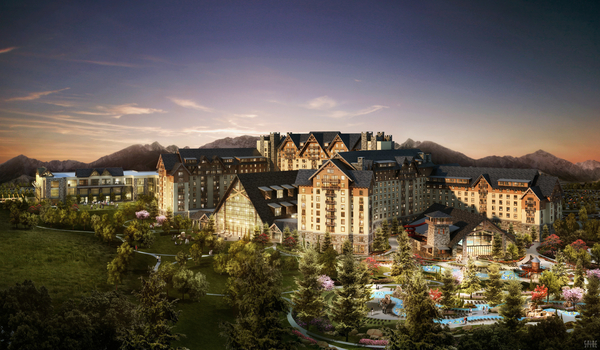 It will be the largest hotel in Colorado. The property’s general manager has said he is looking to fill about 1,500 jobs. Los Angeles-based Ares Management had approximately $121.4 billion in assets under management as of June 30; the company’s real estate division accounts for approximately $10.9 billion of that, according to its website. Nashville-based Ryman is a real estate investment trust that owns four other resorts with the Gaylord name — in Florida, Tennessee, Texas and Maryland — as well as other hotels and entertainment brands, including Nashville’s Grand Ole Opry. RIDA Development is a Houston-based firm that said it has been one of the country’s most active conference hotel developers for 10 years.